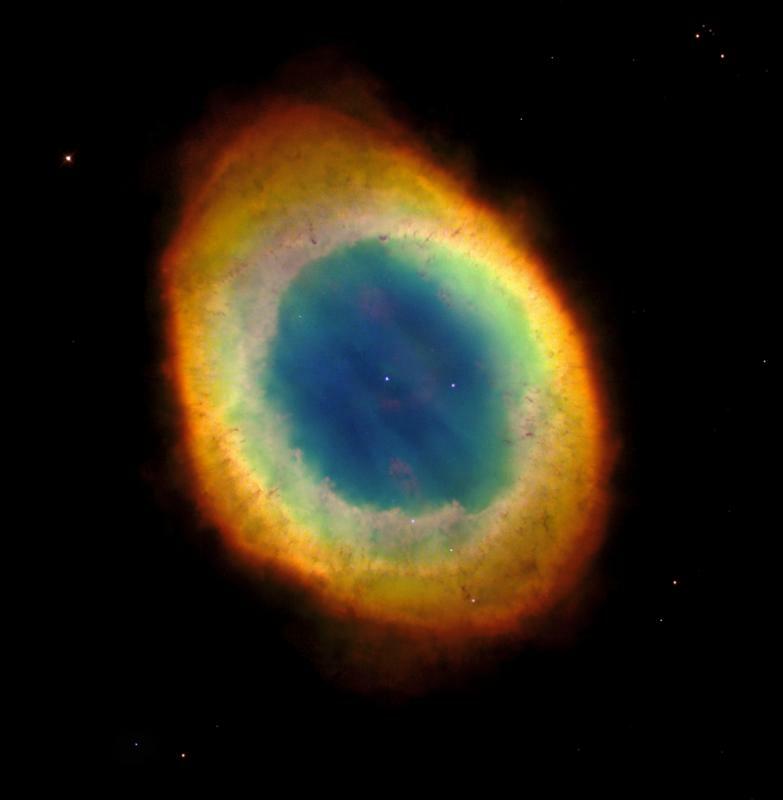 The Ring Nebula by the Hubble Space Telescope. The Hubble Heritage Team (AURA/STScI/NASA). Now Thomas Bensby of the University of Michigan and Sofia Feltzing of Lund Observatory in Sweden have concluded that most of the Earth's carbon came from stars that died gently. By using the European Southern Observatory's 3.6-meter telescope on La Silla in Chile, the astronomers measured the carbon abundances of 51 F- and G-type main-sequence stars near the Sun. All the stars belong to the Galaxy's disk, the component that harbors the Sun and most of the Milky Way's other stars. The astronomers observed a near-infrared spectral line at a wavelength of 8727 angstroms that arises from neutral carbon atoms. By comparing the carbon abundances with the stars' abundances of other elements, Bensby and Feltzing determined how fast carbon entered the Galaxy's disk. This rate reveals whether the carbon came from exploding or nonexploding stars--because the former have much shorter lives. Stars that explode as supernovae are usually born with more than 8 times the Sun's mass. During their lives, these high-mass stars shine so brightly that they burn through their fuel supply fast; thus, they explode soon after birth, hurling elements into space. In contrast, stars with less mass live longer, so the elements they created took longer to enter the Galaxy. Bensby and Feltzing find that carbon entered the Galaxy's disk slowly--much more slowly than oxygen, the elemental hallmark of the high-mass stars that explode. Instead, the astronomers say, carbon enriched the Milky Way's disk at about the same rate as iron and yttrium, two elements that entered the Galaxy slowly. Only the carbon in the Galaxy's oldest stars, such as those in its halo, came mostly from massive stars, because the halo formed so long ago that less massive stars hadn't yet died. "This kind of data is very important," says Cristina Chiappini of the Astronomical Observatory of Trieste, Italy, who notes that carbon's evolution is especially troublesome for theorists to model. "It's very difficult to compute the stellar-evolution models for this element, so there's still a lot of debate about the amount of carbon that each star of a given mass throws off. Bensby and Feltzing did a very careful abundance analysis, so as to minimize the uncertainties." Chiappini notes that the new work has implications beyond the Milky Way. "Understanding carbon, nitrogen, and oxygen is very important," she says. "They are often observed in other galaxies. If you want to interpret other galaxies, you'd better be sure of how the evolution of these elements goes." The best place to gain that understanding, she says, is right here in the Milky Way. The stars that created the carbon in the Milky Way's disk did so when they were red giants like Aldebaran and Arcturus. The red giants fused three helium-4 nuclei to make carbon-12, the most abundant isotope of the element. Some of this carbon seeped into the red giants' atmospheres. The red giants then cast off the carbon-enriched atmospheres, forming planetary nebulae such as the Ring Nebula in Lyra--beautiful bubbles of expanding gas that surround dying stars. As the stars cast off their atmospheres, they metamorphosed from red giants to white dwarfs. Dim and unspectacular, old white dwarfs nevertheless represent the remains of the stars that made the carbon in diamonds, the carbon in pencil "lead," and most importantly the carbon that forms the basis of terrestrial life. Bensby and Feltzing will publish their work in a future issue of Monthly Notices of the Royal Astronomical Society. Ken Croswell earned his Ph.D. from Harvard University for studying the Milky Way and is the author of Magnificent Universe as well as a book about the Milky Way and the origin of the elements, The Alchemy of the Heavens. He has previously written about the origins of nitrogen and fluorine. "Ken Croswell's The Alchemy of the Heavens is one of the very best popular astronomy books in decades." --Keay Davidson, San Francisco Examiner. See all reviews of The Alchemy of the Heavens here.